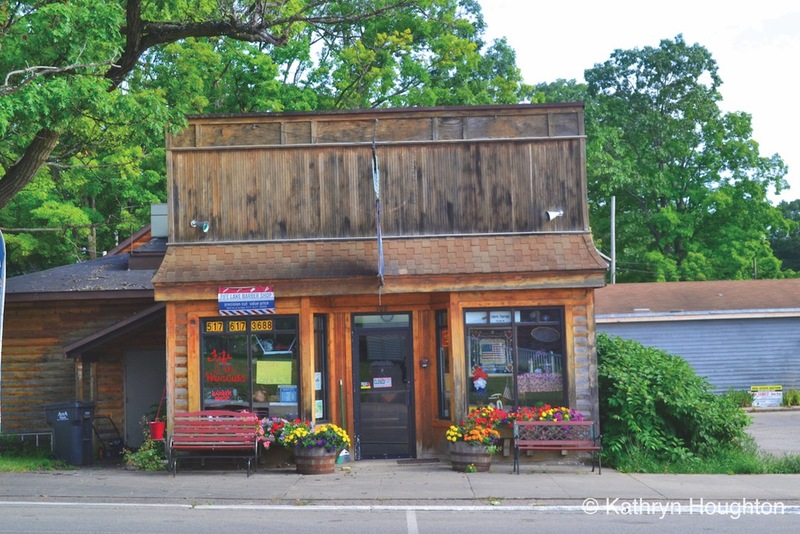 Kathryn Houghton, author of Little Michigan, takes us on a tour of the village of Fife Lake, a town of less than 600 habitants that’s growing once more. 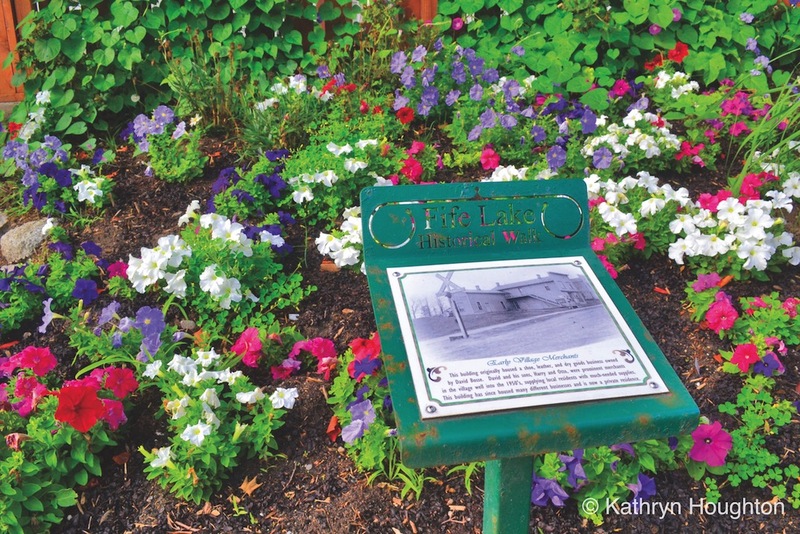 Fife Lake can trace its history as a settlement back to the mid-1800s when a team of surveyors set out to determine the best way to connect Traverse City and Midland by road. They passed the lake now known as Fife Lake, naming it after one of their team members, William Fife. In the early 1870s, railroad workers came through the area while building the Grand Rapids & Indiana Railroad, and they decided that Fife Lake would be a good place for a town. The village was founded in 1872. The early industry in town primarily focused on lumber, especially pine. The first sawmill was built in the village in 1872, at a lumber camp owned by W. W. Bailey. A hotel, some stores, and frame houses followed quickly. The first school was built in 1876. 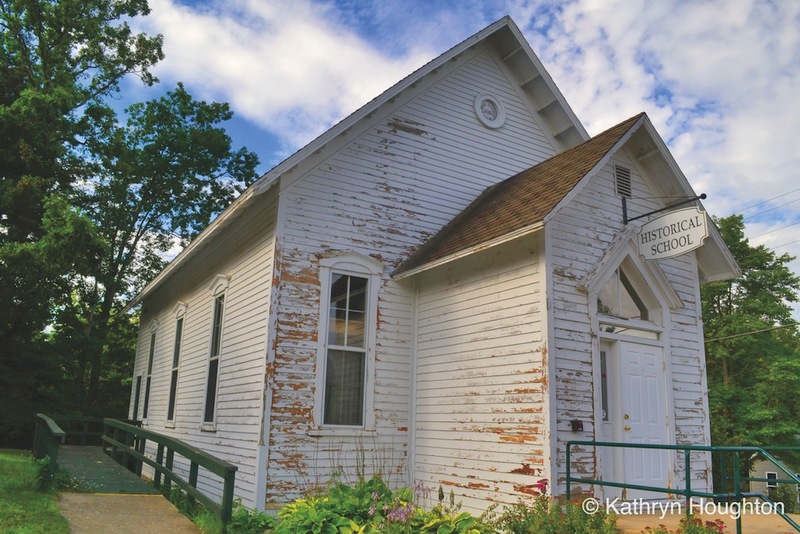 Until the first church was finished in 1884, religious services were held in the schoolhouse. A new schoolhouse replaced the first in 1884, and at that time the original schoolhouse was moved to a new location to become the town’s fire barn. When the town was incorporated in 1889, it had more than 700 residents. Lumber was not the only business in Fife Lake near the turn of the century. There was an ice plant started in 1890, and by the early 1900s, the town had half a dozen grocers, nearly as many dry goods stores, a shoemaker, a baker, a barber, a hardware store, a painter, a carpenter, and its own newspaper. The town also had a bandstand and a lodge for the Independent Order of Odd Fellows and its female auxiliary, the Rebekahs. As with many lumber towns, the economy shifted to become more agricultural as the trees were cleared, but unfortunately, the soil in the area was not good for farming. That, coupled with the end of the lumber boom, caused the village’s population to drop drastically, and by 1920, the population in the town had shrunk to a number less than half of what it had been in 1889. It was in the 1920s that Fife Lake’s prospects began to change, when people starting building cottages on the lake. The town began to grow again, but this time as a resort community, with tourism as its new main business interest. Downtown is home to the Fife Lake Historic Walk. 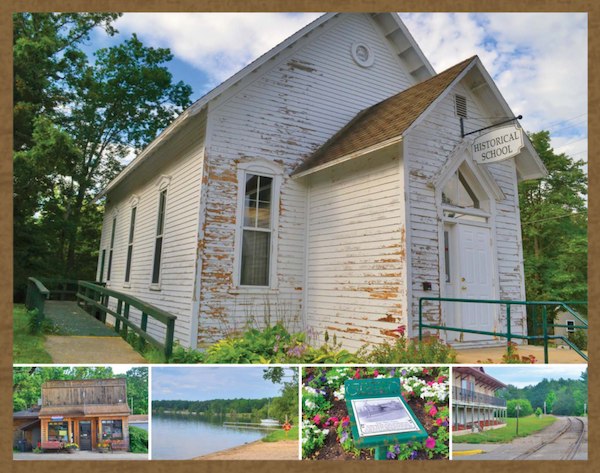 The Historic Walk has 27 stops, and the plaque at each stop contains a photograph of historic Fife Lake and accompanying text. On the walk, you can learn about the old auto sales store from 1920 or see what the depot looked like before it was torn down in 1959. The photos on the Historic Walk are what truly make the experience of reliving the town’s history special. Many of the photos were taken by town resident Willis Brower from approximately 1890 to 1920. What is remarkable about the photos is that so many of them are candid rather than posed shots, giving modern viewers a glimpse into what life was like around the turn of the twentieth century. In 1967, Brower’s daughter Nina donated the photos to the museum, and now they are on display for all to see. Mary McKnight is among the most infamous figures in Michigan history. A serial killer whose weapon of choice was the poison strychnine, she was responsible for perhaps a dozen murders, though the three that eventually landed her in jail for life occurred in the Fife Lake area. Mary was babysitting a 3-month-old baby when the child’s mother returned to find that her baby had died. Soon, the mother, Gertrude, started having seizures and also died. Her husband died not long thereafter. Not much later, however, the bodies of the child and the mother were exhumed, and rat poison was detected in their systems. Mary confessed and was sentenced to life in prison, and investigators soon tied her to other deaths, many in her own family. The story became national news; the New York Times referred to her as the “Michigan Murderess.” Incredibly, she was paroled and released after 18 years in prison. Since reimagining itself as a tourist town, Fife Lake has once again begun to grow. 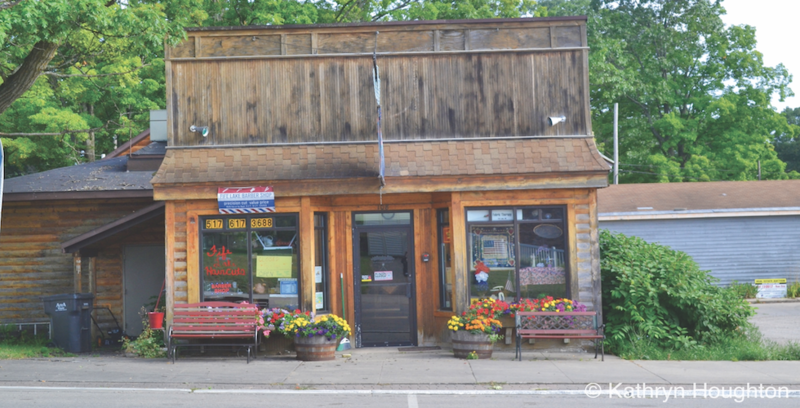 The downtown has a number of restaurants and shops, including a quilting store, and there are lodging options by the lake. There is a laundromat, a hardware store, a hair salon, a barbershop, a veterinary clinic, and an ice-cream parlor. Many of the town’s older buildings still stand, including the original schoolhouse-turned-firebarn, a second schoolbuilding, the hardware store, and the building for the museum. Three churches serve the area: St. Aloysius Catholic Church, the Fife Lake Baptist Church, and the Fife Lake United Methodist Church. The town also has a park, a village hall, a library, township offices, an elementary school, and a post office. There is a private marina, as well as a public beach and boat launch. Fife Lake itself covers more than 600 acres and contains two islands. It is a good spot for fishing for bluegill, pumpkinseed sunfish, pike, walleye, and various types of bass.